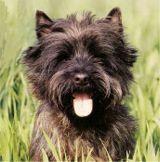 You will not find two Cairn Terriers who are truly alike, as each has its own distinct personality and character. 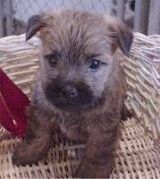 Generally independent, the Cairn Terrier will sit on your lap for a few minutes, but will soon be wriggling and keen to explore! Cairn Terrier puppies need to know who is in charge, otherwise they will have a good go at being in charge of the house themselves! Cairn Terriers have an inborn love of children, and being physically tough, are able to overlook the odd squashed feed and clumsy mishaps from over-zealous little people! Thriving on attention, the training of a Cairn Terrier will suffer without constant input from the humans – they also love to dig, so be warned – don't leave your puppy alone with the flower bed in your back yard! Bred over 200 years ago on the ancient Isle of Skye and in the Scottish Highlands, these dogs originally earned their dinner by chasing out vermin from the rock piles (known in Scotland as cairns). They were highly prized for their working ability, rather than their looks. Courage, tenacity with a waterproof coat and strong jaws – Cairn Terriers were much sought after by generation after generation. Even today the breed is true to it's ancestry with strong jaws and big feet, with strong pads and tough nails for better digging – and a fearless streak that will doubtless get him into trouble if his owners are not responsible! Our 4 Paw Rating - to the suitability of the Cairn Terrier for your home and lifestyle. Loves children and people, and will bond with the whole family. Needs early socializing with other animals. Due to his size and exercise requirements, equally suited to a small house as one with a huge backyard. Happy with apartment living, as long as he gets plenty of attention! Very energetic breed, loves to have free running and jumping in open spaces – but ensure that he is trained to return to you when called beforehand! !